I wanted to start carrying a revolver as my everyday carry (EDC) gun. 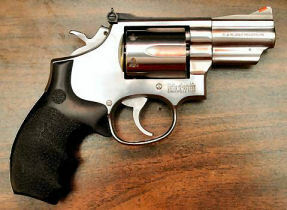 I didn’t want to be limited to a .38 Special, 5-shot revolver, although they are smaller and easier to conceal. I found a good deal on a used Smith & Wesson model 66-2 with a 2 1/2“ barrel, which is a 6-shot revolver chambered in .357 Magnum. 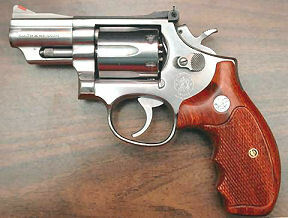 As you know, this will also chamber .38 Special which makes this revolver more flexible. 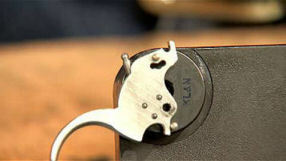 This is a K-frame, mid-size revolver, which is still easy to conceal. Yes, there are 5-shot .357 Magnum revolvers on the market, but this gives me one more shot, and besides, I got a great deal. Because I purchased this revolver online, I was not able to inspect it. When I received the revolver, I performed an inspection like I do for all firearms that I purchase. The gun was clean (surprise! ); the frame and crane were strait, ejector rod was not bent, and the bore was clean and bright. There did not seem to be any problems with timing. The grips were after-market and did not allow easy use of a speed-loader. I immediately noticed that the slots in the screw heads were wobbled, indicating someone used the wrong sized blade to remove them, and there were scratches on either side of the yoke screw. These are strong indications that someone had been inside. One major problem I discovered was that the revolver experienced hammer push-off. With the hammer cocked in single-action mode, when I pushed on the hammer with my thumb, it released from the sear and fell. This is a very dangerous situation! Someone probably tried to polish the sear without using the proper jig and rounded it. Many comments on the Internet said to cut off the hammer spur to make it into a double-action only firearm, but I wanted the gun to function as designed. I disassembled the revolver following GunBlu490’s video. Brownells sells specific screwdriver bits made to fit S&W revolver screws. https://www.brownells.com/gunsmith-tools-supplies/general-gunsmith-tools/screwdrivers-sets/magna-tip-bit-sets/s-w-combo-bits-only-sku080087002-406-42598.aspx?rrec=true I always use the correct screwdriver bit that fits the screws so I don’t bugger them. I used these bits to remove the screws and prevent any further damage to them. I did purchase a new set of screws (see below) because I wanted the gun to look good, not buggered. Inside I discovered the moving parts were coated with an excessive amount of oil, some of which had congealed into a sticky goo. I used acetone to remove the residual oil and generally clean the inside. Warning: Do not attempt to polish the sear without a proper jig. Polishing the sear by hand can cause rounding of the sear and a dangerous, unsafe condition. I examined both the sear on the trigger, and sear notch on the hammer. The sear notch was very shallow, but still looked sharp under a magnifier. The sear on the trigger, however, was rounded. 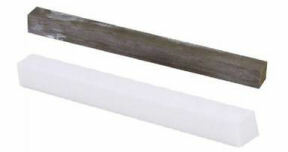 The hammer and sear are case hardened, but the hardening only goes 4-6 thousandths deep, so any polishing must be very light, and not aggressive to break through the hardening. I installed the K, L, N adapter onto my Power Custom Series I Stoning Fixture as shown in Larry’s video. The adapter and fixture are both available from Brownells and MidwayUSA. The instructions that came with the jig stated to move the adjustable guide up 20 clicks. I coated the sear with blue marker to ensure I was polishing the sear flat. I used the medium-fine stone to reshape the sear nice and flat so the front edge was sharp. I final polished with the extra-fine stone to get a mirror polish. I lubricated the inside of the revolver as shown in GunBlu490’s video and reassembled the revolver. I used BreakFree CLP as the lubricant because it leaves behind a very thin coating of Teflon. I installed a Wolff K, L, N spring kit which reduced the double-action trigger pull from 7 lbs 8 oz to 5 lbs 2 oz. The revolver now functions correctly with no hammer push-off. Hopefully, I didn’t remove the case hardening from the sear so it won’t accelerate wear. I purchased a set of stainless-steel frame screws from eBay for $25.00 which I thought was very reasonable. I just didn’t like the look of the buggered screw heads. 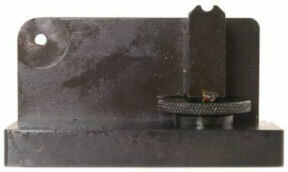 The set consisted of two crowned side plate screws, and one flat-head side plate screw. The flat head screw fits underneath the grip, the two crowned screws fit in the other two holes. The front screw is also the yoke screw and must be fitted so the bottom of the screw doesn’t touch the yoke causing it to bind. 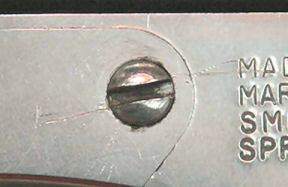 The sides also cannot bind against the groove milled in the yoke. The yoke must be able to rotate freely with a minimum of front to back movement. When I attempted to install the yoke screw into the frame without the cylinder and yoke installed, the screw was very tight in the threads. When I examined the original yoke screw, I noticed that the threads were flat, not sharp like the new screw. I wrapped a piece of 320-grit wet/dry sand paper around the threads, pinched it between my thumb and finger, and used a screwdriver to turn the screw back and forth a few times to flatten the threads. I cleaned the threads with alcohol and tried to screw it into the frame. The first time the screw was still tight, but after a second time the screw fit with no problem. As mentioned before, when manufactured, the yoke screw is the same length as the crowned side plate screw. However, it is too long to serve as the yoke screw. If installed as is, the end of the screw will rub against the yoke causing it to bind. I coated the end of the screw with a marker and rubbed it on the 320-grit wet/dry paper to reduce the length, then installed the screw to test the fit. I didn’t tighten the screw; I turned it down until I just felt some friction. I opened and closed the cylinder and if I felt any binding, I removed more metal from the end of the screw. I continued to remove metal and test fit until I could tighten the screw and open and close the cylinder with no binding. Because this screw is now fitted it must be installed in this position. Installing the other crowned screw in the yoke screw position will cause the cylinder to bind. There now, doesn’t that look better? Eventually I will probably try to buff out the scratches, but that is a project for another time. I also installed a Hogue mono-grip because I like the look and how it feels in my hand. Other folks don’t like the rubber grips because they catch on clothing when carrying concealed, but I wanted to try them out. The wood grips that came with the gun caused speed loaders to bind, but the rubber grips do not get in the way of the speed loaders. Working on trigger sears should NEVER be attempted without the proper jig. Yes, these tools are expensive, but not nearly as expensive as replacing damaged parts. And using proper sized screwdriver bits prevents screw heads from becoming buggered. Damaged screw heads are a sure sign of amateur work. © Copyright 2019 Roy Seifert.